What They Say......There’s only one place in the world that lonely twelve-year-old Walter Lavender Jr. feels at home: The Lavenders, his mother’s unusual West Village dessert shop, where meringues scud through displays like clouds, marzipan dragons breathe actual fire, and the airy angel food cake can make customers pounds lighter. When the mysterious and magical Book at the heart of the shop vanishes and a landlord threatens closure, it’s up to Walter to find the Book and save the shop. 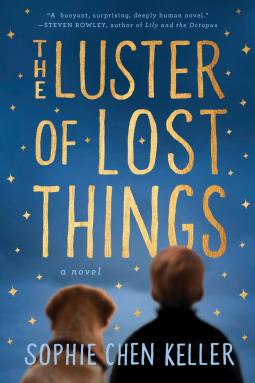 Despite—or because of—a communication disorder that renders him speechless and friendless, Walter has a special ability to find lost things. In fact, the only thing he’s failed to find is his father, a pilot lost in a presumed plane crash at sea before Walter was born. Accompanied by Milton, his best friend and overweight golden retriever, Walter’s quest will take him around and under New York City, into subway tunnels and soaring over Central Park, from bottle collecting in Chinatown to racing through the Met, and introduce him to the extraordinary and forgotten people of this fantastical city. Along the way he will discover his voice and learn what it means to truly be found. What I Say.....I love magical realism, it's one of my favorite genres. And not enough people write it - lots of people do realistic fiction, and lots of people do fantasy, but to do the balance of magical realism is tough. But I'm always willing to give a new to me author a try! 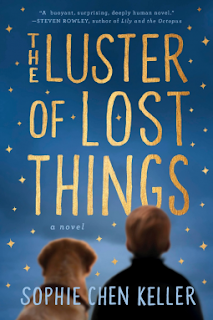 So when I saw The Luster of Lost Things by Sophie Chen Keller, I was excited to read it. Walter Lavender is a shy, lonely boy. He lives with his mother, and spends his time away from school at their bakery, where the baked goods have a life of their own. The Book that gives the bakery it's power is stolen by a greedy new landlord, and all of the baked goods are suddenly just normal baked goods. Without the magic, business quickly dries up. Walter doesn't speak much, and he doesn't have any friends except for his dog, Milton. But what he does have is a talent for helping people find lost things. Walter's love for his mother and the family they have made for themselves lead him to set out on a journey to recover the book. Along the way he meets so many different people.. People who are homeless, people who have created world in subway tunnels, and most difficult for him, a girl his own age. As Walter navigates the outside world (worrying his mother to death), he gains his voice, and his strength. All of the people that he meets are damaged a little in some way, the same as him. And in this, he is found. I loved this book! I held my breath a little when he was in the subway - I was so sure he was going to be kidnapped! And I was so frustrated when he kept finding the book in pieces. The thought of pages being ripped out of a magic book made me ill. But after I finished it, I realized the best books are the ones that truly make you feel uncomfortable emotions. It means you are really invested in the story.